Once again, I was lucky enough to enjoy a ten day holiday on the Côte d’Azur. We stayed in Antibes for a week and then went to my favourite place, Juan Les Pins for the last three days. 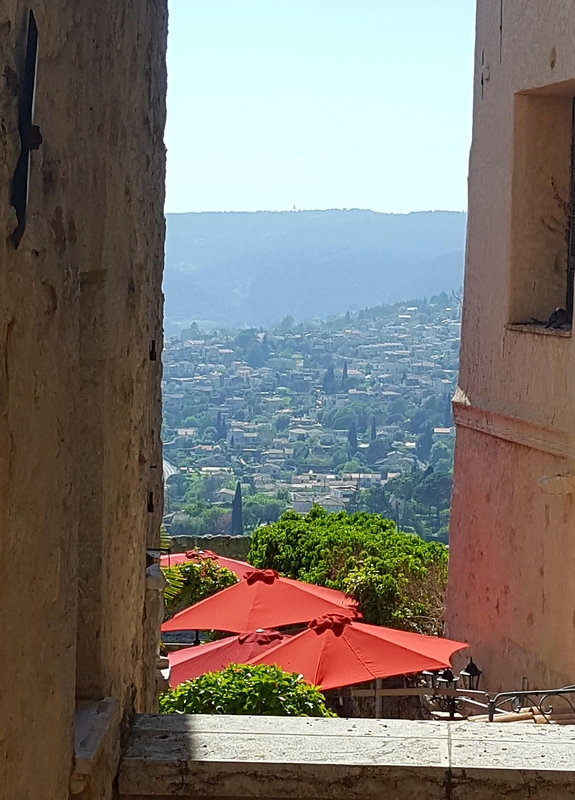 During this exquisite holiday we did visit the Provence area and one of the places we explored is the beautiful Saint Paul de Vence. We parked on the hill near the actual village. It is bizarre how the village looks miles away, but is, in fact, a short stroll from the car park. We passed the chaps playing boules and I wondered (out loud) why all the players are male? We assume this is how some of the retired French chaps spend their retirement. 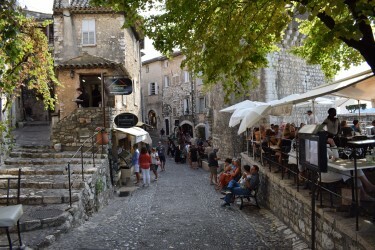 The rocky outcrop of this omnipresent village, St Paul de Vence, is certainly one of the most fascinating villages to visit. 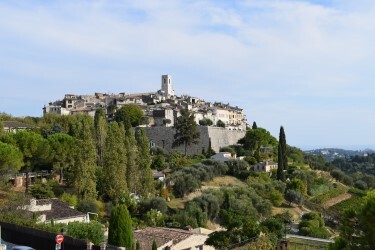 As you drive towards the village, it appears to be both floating and protruding amongst the surrounding landscape of the Provence. No wonder it attracted artists such as Marc Chagall, Henri Matisse, James Baldwin, Jean-Paul Satre, Picasso and the Rolling Stones bassist, Bill Wyman is said to have a home in this area. 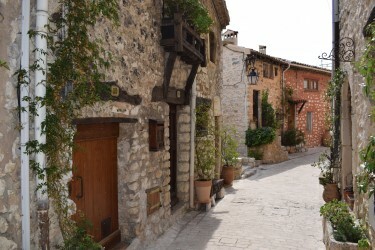 The walls of this historic village are from the mid-15th century and astonishingly have not changed since they were built. 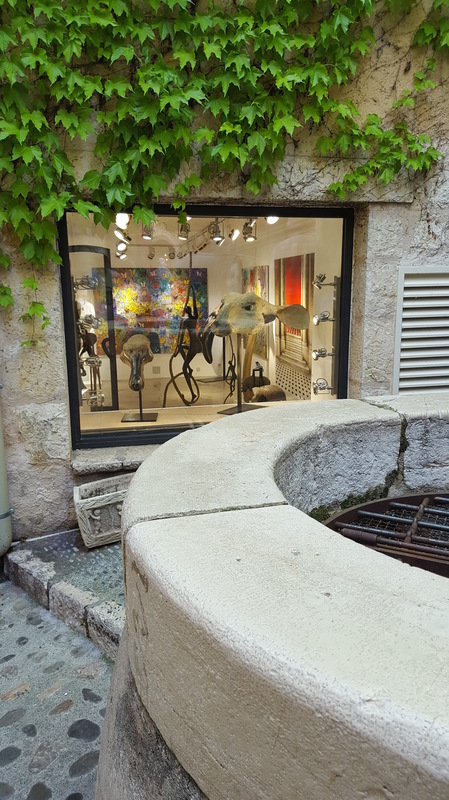 St Paul de Vence itself is serene and compelling, especially if you like contemporary art and beautiful views. 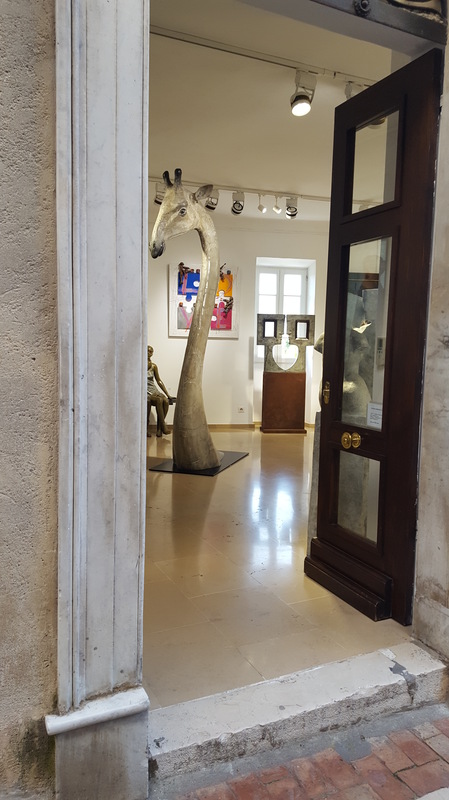 The winding paths are enveloped by beautiful scenery and copious art galleries. 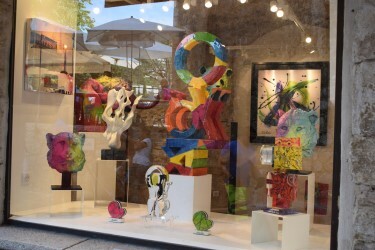 To be honest, this is my idea of bliss; an array of paintings, sculptures, drawing you into the artistic spaces. It is also fun to lose yourself in the maze of ancient paths, curious street sculptors, ceramics, fountains, flowers and spectacular landscape. 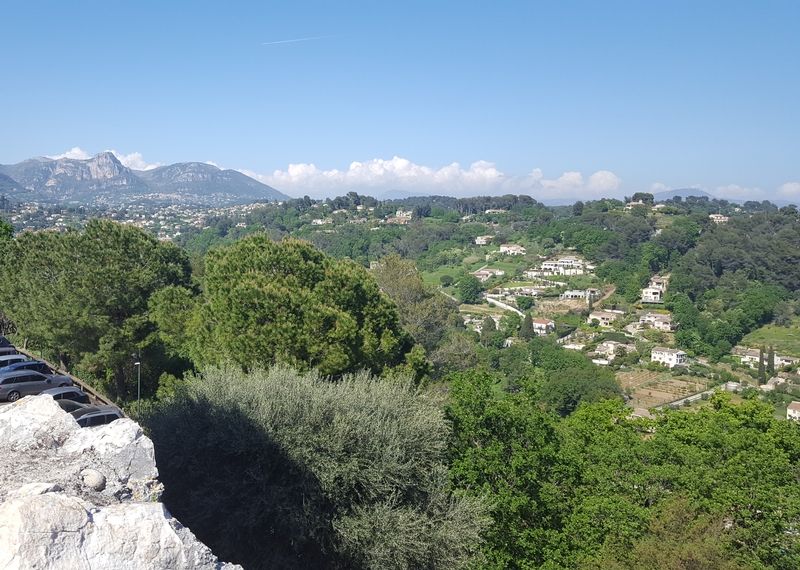 If you wander away from the crowds, as we did, you enjoy the quiet back streets and views of the superlative Côte d’Azur. Such a haven for dripping plants, arty discoveries and inspiring views, particularly if you are creative. Whilst visiting a quiet area, we heard a car coming and rapidly stepped to one side. A large gleaming Bentley, shimmering in the sun, stopped abruptly at large gates. The driver waved to thank us for jumping out of the way. The man in the back had a rugged look about him and wore a floppy hat. Wondered who that was? Beautiful, old car. Oh, that’s the other thing about this region of the world, you see some glorious, classic cars. This magnificent village is a great place to wander and enjoy some ice cream, cuisine, art, sculpture, historical architecture and scenery. Great to see how well this village has been preserved among the citrus trees, flowers and vineyards. We visited at the end of April and it was fairly busy, so it is probably packed during July and August. This ubiquitous place is truly wonderful, insightful and uplifting, so I’m not really surprised. 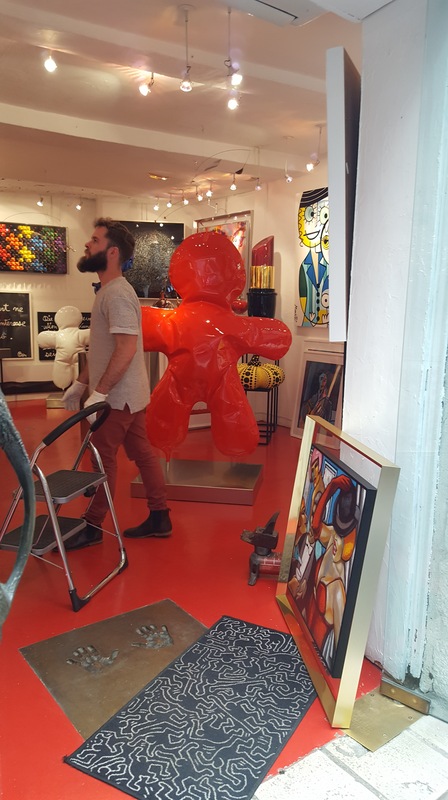 It is 7km from Cagnes sur Mer and between Nice and Antibes. Do visit and more travel posts coming up.